Global Commentary - Global Diversified Investments, Inc.
Capital markets and the global economic environment have provided a good amount of intrigue in the last 8 or 9 months, to say the least. The Fed has been at slight odds with the President, which for as long as I can remember was not really an issue we have ever had to deal with. Brexit and the overall uncertainty surrounding its impact remains heavy in the region and Chinese growth and trade realities waffle between good and not-so-good news on a weekly basis. The yield curve inches ever closer to meaningful inversion and the IMF lowered their global economic forecast to 3.3% for 2019 (down from 3.5% posted in January). In that same report, they now expect U.S. growth to be 2.3% for the year, which they lowered from January’s number by 0.2%. One positive, however, is that their expectation for Chinese growth is forecast at 6.3% for 2019, which was an increase of 0.1% from January’s number. The next 3/4’s will likely flow with similar themes represented these and other economic and market indicators to come. There remains support for maintaining and adding strategic global exposures as we close the year, especially in fixed income. Realizing the objective of obtaining non-correlated returns and risk management benefits in all portfolios is becoming paramount. The current and upcoming economic realities and lingering risks provide an opportunity to reiterate how sound fundamentals alleviate not just uncertainty, but also provide much needed comfort in that uncertainty. For those of you that have read my commentaries for any amount of time, you realize this theme throughout all the years I have communicated my strategy. What I would like to also communicate is that this framework of thought has guided my overall approach to investing for over 20 years. One of my favorite quotes from Warren Buffett is “Be fearful when others are greedy and greedy when others are fearful.”. I realize that I have communicated this quote before, however, I will now address why I think he places the words “fearful” and “greed” in the order he does within that statement. First, Mr. Buffett starts his quote with addressing greed in others. The reason I believe he does this is that it is the greed, the run up in prices and the resulting crash which has the greatest negative impact on an investors and broader market psychology. Misinterpreting greed and exaggerated valuations have resulted in devastating effects on wealth for generations. A positive, at least for those founded in sound investment frameworks, is it provides the greatest opportunity to add good investments on the “cheap”. This leads me to the second part of his statement relating to our “greed” when others are fearful. Though I have not had the opportunity to speak with Mr. Buffet personally about this, I believe that it is not the same type of greed mentioned in the first part of the quote. Our greed is one that is to be rooted in fundamentals and strategy and when executed in that vain, the long-term value will be undeniably positive. Using this approach in building a resilient portfolio and maintaining an unemotional mindset when approaching your investments is key to sound risk-managed returns and limited losses. When investment management is approached in this manner, it provides a solid foundation for weathering all economic cycles. For my outlook for 2020, I am still expecting that the U.S. economy will face recessionary pressures. I will state again that baring any “tail event”, these recessionary pressures will be no where near a 2008-level scenario and that recessions, in general, provide opportunities to add quality holdings at optimal prices. Much of the reason I still feel recessionary pressures exist is based on a few fundamental economic components. First, inflationary risks are becoming more significant. Oil is up 42% for the year so far and the Wall Street Journal reports that twice as many U.S. companies have raised median pay when compared to last year. This puts pressure on company earnings and when that pressure is combined with slower growth, companies will begin to tighten their belts and approach any new business investment and hiring much more conservatively. Secondly, student and consumer debt has reached new highs of late and there is a considerable risk to consumer spending as a result. Consumer spending drives over 70% of GDP growth, so even a moderate change in spending will have negative economic results. Lastly, interest rates and the yield curve are beginning to show signs that investors are needing to be compensated more for risk, especially in the shorter-term. Risk pricing has not been at the forefront in recent years, however, it will be again very soon. The increases in rates, especially in the short-end of the curve, and the resulting impact on consumers, companies and governments will put pressure on the economy. When these realities are combined with a diminishing global growth picture and trade uncertainties, there is a high likelihood growth will slow in 2020. But again, recessions are not to be feared, they are to be exploited. I will close with the offer to speak to any reader directly about this, or any other economic or business reality. As an adjunct professor at two universities, I find myself being called to continuously improve on how I help prepare individuals for the probable outcomes we all face in the financial world. Whether or not you are interested in my investment framework, feel free to shoot me an email to arrange a time to chat. The recent drastic fluctuations in global markets has delivered on a volatility story that has been more significant than even I expected and wrote about in my commentaries leading up to today. Volatility as represented in the CBOE Volatility Index, more broadly known as the VIX, went from posting numbers between 11 and 18 (around 40% fluctuation) in the last 6 months to going from 11.61 in early October to 25.23 (over 50% fluctuation) in the 20-days closing out the month. The 200-day moving average for the VIX sits at just over 14.6 and it is listed at around 17 this morning. Given the markets whipsaw behavior recently and the continued uncertainty around trade, China and interest rates, the volatility story is likely not going to change anytime soon. The drivers of this volatility relate to many of the fundamental factors I have presented before, as well as a few that I have not. I read an interesting article recently that pointed out the relative size and impact of what they described as program trading and the automatic algorithms and complex trading strategies that buy and sell according to pre-established frameworks. The basic conclusion was that volatility is exacerbated by these machines buying and selling large volumes of holdings based solely on price movements. As I have stated many times before, at GDI we are investors, not traders, and I diligently seek out diversified exposures that will provide solid value into the future. This does not, however, eliminate the direct exposure to the risk of volatility, it simply creates an opportunity to hunker down and verify that the fundamental portfolio strategy and design can withstand the volatility in order to accomplish the overall objective of the portfolio into future years. It also provides opportunities to add strategic exposures that may be trading at historically lower levels. Earnings reports from firms have been decent overall and Nonfarm Payrolls came in recently rising 250,000 from last month, which topped the median estimate of 200,000 from economists. As a result, the unemployment rate stands at a 48-year low of 3.7%. Jobs, spending, and company earnings that justify P/E ratios are all integral for a continued appreciation of investment assets. One notable item related to jobs is the reported increase in average hourly earnings of private workers rising by 3.1% for the year. This is the largest increase in about a decade. This reality will undeniably put pressure on the bottom lines of employers and squeeze margins across many organizations. It will also provide the Fed with sound justification related to inflationary pressures for additional rate increases in coming meetings. Additionally, there are reasonable risks to company earnings when employment costs rise AND interest rates rise at the same time. For the sake of not restating my expectations and timing estimates for a recession from my last commentary, I will simply state that these two factors only contribute to the broader risks of a recessionary condition. In closing, I want to reiterate that the volatility in the market should be viewed as a necessary byproduct of the current investment landscape. And if you don’t need your investment funds turned into cash in the short-term, the volatility can be weathered unemotionally and soundly by executing a disciplined investment framework and taking advantage of discounted pricing on solid exposures that generate value in the years to come. For the most part, the first half of 2018 delivered much of what I tried to prepare readers for, and some, which I did not. First, global market volatility began to really get a foothold as we closed the first 6 months of the year. Most of you likely recognized this fact by listening to the talking heads in the financial media or looking at your monthly portfolio valuation variances. I had expected the volatility of global markets to become more significant in 2018 and communicated that fact in my recent commentaries; I just did not expect much of the volatility to come from the risks of a trade war instigated by the President. Secondly, the Fed was on track to raise rates at a consistent pace this year, however, I had a greater weight on wage growth as a contributor to inflation (and the rapidity of the rate response) than what actually occurred this first half of the year. There are a few reasons for this disconnect, but I will leave that discussion to the few of you that call me directly to speak about such things. Thirdly, the performance of the GDI Asset Allocation Framework performed reasonably well overall in the first-half as there remained optimism for global economic growth and corporate earnings. There have been some price pressures recently on assets exposed to China and other emerging economies as a result of the building uncertainty around trade, and the relative value of those portfolio exposures has reflected that in recent weeks. I will step out again in defense of such exposures and state that those holdings, though pressured in the short run, remain viable for recognizing the longer-term value of diversified global growth in the coming years. I will qualify that by stating that the recent volatility is here to stay and that the second-half of 2018 will potentially be even more uncomfortable in terms of daily price swings. This is due to the existing pressures such as trade, being combined with the ever-increasing debt loads of institutions, consumers and governments. As rates rise and debt loads have ballooned to historical levels, it rarely ends well for the markets overall. Generally speaking, recessions put pressure on jobs, asset values and usually instigate some level of government stimulus. A real issue is that there may be less available impact from any government intervention due to the relatively-low starting point of interest rates, which when decreased, has historically been a powerful tool in juicing the velocity of money. What’s more, job losses may be more permanent as automation begins to fill the human component in certain parts of the economy. Now to the question you are all likely most concerned with, what will be the impact on the investment assets you hold? The analysis presented below should provide you with a tool to help manage expectations in that regard. I have taken the current GDI Asset Allocation Framework as it is implemented in the base portfolio, and even though exposures vary between each client here at GDI, the table below displays how the fundamental existing allocation framework would have responded through 2007-2009 on a weighted average basis for a simple USD 100k portfolio. 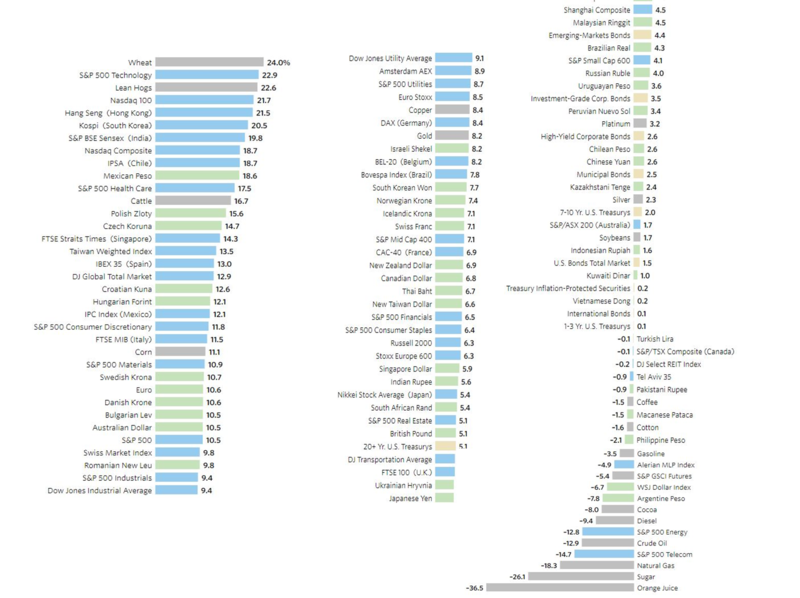 I utilized widely used indices for each exposure category and stated their relative performance each year. The previous recession was by far the worst in our history and impacted global markets significantly and as I already mentioned, most do not expect the next recession to be as painful. Having said that, and considering the GDI Asset Allocation Framework is designed as a 4-to-8-year strategy, the two-year impact using the worst recession as an example and considering a 2% dividend (estimate for the framework), the portfolio loss would have only been just over 9%. I would like to note that this loss on these exposures was well-overcome in the following years. My point is that selling those exposures in the last recession for USD, only to buy them back at some point would have incurred trading costs, tax implications and also, probable timing inefficiencies. Would I have bought them back at the “right” time? Remaining steadfast and invested in the strategic asset allocation exposures in the worst recession in our history would have resulted in 2 years of minor valuation pain while enabling entrenched participation in the next 9 years of expansion and valuation growth. I present the analysis by confirming that historical performance is not an indicator of future performance and that each investor should perform extensive due-diligence on investing and trading tactics for their respective portfolio exposures in any and all market and economic conditions. In closing, Mr. Newman in that Yahoo Finance article puts it best by stating, “Recessions also create opportunities, for those able to ride them out. Investors with cash on hand can buy low as stock prices drop. Homes become more affordable as prices moderate and interest rates fall. Businesses have access to a broader pool of workers. And employers shifting strategies become interested in new forms of innovation.” I have come to the conclusion that, if anything, recessions are a time to add even more of each exposure at discounted prices, so I am sort of looking forward to it. My quote on a forum from 12/07/2017 relating to BTC, “Be careful people, assets are only worth something if they provide stable value into the future”. First, this is not to discredit or delegitimize any asset allocation strategy. This note and following graphics are designed to provide insight into how the GDI Asset Allocation Framework is implemented. Second, this is not a recommendation or suggestion to buy or sell ANY security, asset or instrument. Finally, feel free to reach out to me directly to discuss and remember; building wealth is not the same as getting “rich”. The GDI framework includes numerous securities that provide a particular target risk profile and relative return benefit to each managed portfolio. The holding I use for the example below is The Boeing Company (Ticker BA). This company was added to the GDI Asset Allocation Framework many years ago as a result of its sound fundamentals. It is a company valued at around $194 Billion; it has an attractive 5-year price profile and pays a dividend of over 6.75%. Though the price has been bid up in recent years, the PE remains under 25. I have compared the price characteristics of BA and BTC over a period of 1 year and have displayed the relative price profiles from 12/07/2017 below. This corresponds to the date of my initial note of caution. The final point I would like to make is that I highly recommend a prudent, risk-managed approach to investment management. I suggest understanding risk appropriately and that you adequately grasp your investment decision(s) impact(s) on your broader financial goals. Risk management requires a disciplined approach that is free from market hysteria. 2017 was a year where equity valuations continued to demand a premium, nuclear threats were brought up regularly and Bitcoin became a household term. It was a year that began with a great deal of optimism for economic stimulus from the new President’s infrastructure and tax plans and positive expectations for global growth overall. It was also one that regularly revealed a pervasive issue facing government, Hollywood and the American workplace as a whole. My role as investment adviser and teacher provided me the opportunity to extrapolate guidance from numerous sources throughout the year. My conclusion after digging deep into those sources can be summed up by the historic quote "The more things change, the more they stay the same," (Les Guêpes, January 1849). Bitcoin was bid up to extraordinary levels through what has been best described as a “gold rush mentality” and experienced volatility reminiscent of the frenetic trading that occurred back in the dot-com boom (and bust). President Trump’s tax reform plan became a reality, passing in both houses of congress, whilst attracting unrelenting partisan headwinds the entire way. And unfortunately, the American workplace appeared to be no safer for women than before laws existed to protect them. Seriously, where have all the gentlemen gone? Lastly, we were seeing long-range rockets being launched, which could potentially bring a nuclear threat right to our front door. What does all of this mean for investors and for your portfolio specifically? In a nutshell, everything. Culture, safety and the resulting consumer attitudes and spending that occurs when fundamental government and economic structures are healthy is positive for investing and diversified portfolios as a whole. Any combination of negative effects on these, however, can become extraordinarily painful and fuel uncertainty. Helping my clients manage the potential uncertainties will be my focus in 2018. I will start with a quick assessment of Bitcoin and the overall crypto and blockchain environment. For many readers, Bitcoin became a term heard daily in 2017 and as we begin 2018, I have been receiving calls from various individuals, all with the same basic premise of seeking guidance on how they could get “in” on the space. I cautioned the early adopters of Bitcoin about the overall risks associated with a global unregulated currency years ago and though some may suggest I am a “dummy” for not putting money in then, I am convicted by my standards of investment protocol. This is not to say that Bitcoin, or any other crypto-currency for that matter, is not inherently valuable or that currency independence and transaction efficiencies are not worthy of pursuing by any means, I just have a diligent focus on risk management and volatility management and Bitcoin has never made its way into that fundamental framework due to its parabolic price moves. Having said that, I believe blockchain and the crypto space has extraordinary potential and I will be working hard in 2018 to learn how blockchain and Ethereum can provide not only a global currency alternative, but also value-based functionality in terms of agreements and other processes. I will not bore you with the details here, but I am happy to chat personally with you regarding this quickly-developing space. Crypto-currency and blockchain technology is here to stay and it provides solid opportunities for improvements in numerous industries from cyber-security to retail to government and to healthcare, but as with any investment, you should be prudent first and opportunistic second. From a global markets perspective, there continues to be support for broader asset appreciation and solid returns for well-diversified holdings into 2018. Though returns may be lower than in 2017, the tax legislation could provide a boost to earnings of corporations and overall business optimism, and there remains opportunity for emerging market and other global exposures to outperform based on global growth and a continued USD weakening trend. Additionally, as interest rates start to rise, there are some benefits to owning strategic fixed income investments. I continue to have cash ready on the sidelines for placement and will start tactically purchasing specific holdings for many of the portfolios I manage once valuations become reasonable from a historical basis. The S&P 500 index still stands at a historically-expensive 18.2 P/E, while the 25-year average is 16. This is considering that we have had a few good earnings releases and a significant portion of the firms in the index are exposed to global markets and, as a result, benefit from USD depreciation. USD as represented by the Bloomberg Dollar Index stands at a 3-year low and for the reasons I mentioned back in 2016, it still has room to depreciate further due to fundamental and technical drivers. JP Morgan reports that corporate cash as a percent of assets is around 30% compared to 20% ten years ago, and even though YoY GDP growth here in the U.S. remains below the average of 2.8%, both real housing starts and capital goods orders are both standing at or near their respective 20 year averages. The reason I bring this up relates to the real prospect that this equity market price appreciation could be supported by these and other related statistics in 2018. Most economists are expecting global GDP growth to be over 3% in 2018 and the IMF forecasts that 2018 will have the fewest countries in recession since they have been forecasting such things. The U.S. Federal Reserve Bank has a new chairman named Jerome Powell who is taking over for Janet Yellen, however, many expect much of the same in terms of commentary and policy. Lastly, Goldman Sachs is placing a 10% probability of a U.S. recession in 2018 given the favorable global backdrop. They did, however, go on to on to state the risk of a market pullback is higher in 2018 given the current levels of valuation. Some not-so-great-news is that in spite of interest rates on mortgages being well below the 40-year average of over 8%, housing affordability is 30% less than the 40-year average and home prices relative to income are nearly 20% higher. Also student debt is reported to be at 10% of the debt on consumer balance sheets, which will undeniably affect spending for those individuals for many years to come. The flipside to this potential negative is that as Goldman Sachs reports recently, “Debt as a share of GDP has declined for households, financial institutions, state and local governments, and the aggregate private sector”. It is a bit unsettling to read in that same report, however, that “There are nearly four times as many bulls as bears in the most recent American Association of Individual Investors’ (AAII’s) survey, close to an all-time high.” Remember though, being overly bullish does not kill a bull market, fundamental flaws in structure and irrational valuations do. When an asset is purchased, it should not just be because of its return potential, but also its contribution to the strategic exposure mandate and overall portfolio value for the medium-to-longer-term. Exposure management has never been more important in order to achieve non-correlated returns and improved risk profiles. Global risks like polarization in the US, growing populism globally, heightened geopolitical tensions, terrorism and the potential for cyberattacks are not going away anytime soon. One thing that I can confirm is that the sound, well-diversified approach to investment management that GDI has implemented in the last 8 years, has displayed that a prudent and strategic approach, though not particularly exciting, provides stability in many market conditions that we have faced and will face into 2018 and beyond. Much of the expected market volatility I spoke about in my previous commentaries has not (yet) meaningfully materialized in this first half of 2017. I will note, however, that the aforementioned volatility still remains a solid potential given a few reasons, including the fact that the S&P 500 Index is trading at a price-to-earnings ratio of nearly 25, while the historical average is somewhere around 15 and the Dow Jones Industrial Average has also now pushed over another psychological barrier, trading at over 22k this morning. I suggest maintaining a prudent approach to adding assets in this market and continue to support the case for adding strategic exposures in any market correction. Having said that, and before I provide an outlook for the remaining half of 2017, I would like to cover a few things that have provided notable impact to a globally diversified portfolio framework in this first-half. First, the pressure on US Dollar, which I have been bringing up in just about every commentary since mid-2015, is now alive and kicking. The dollar is down 9.19% so far this year as measured by the DXY, which The Wall Street Journal reports as “Its worst stretch in six years, as investors turned more confident that the economic recoveries around the world are gaining or surpassing growth in the U.S.” They went on to state that the US Dollar lost 1% in the last week of June alone. Bloomberg reports that “Speculator and hedge-fund net short positioning on the dollar have risen to the highest number of contracts since 2013, according to the latest CFTC report. The currency slumped to a five-week low against the yen”, and that “The U.S. dollar wrapped up July with its fifth monthly loss, the currency's longest losing streak since 2011”. There are a few drivers of this, including the global economic growth prospects vs. the U.S. as well as many market participants coming to the realization that the benefits of infrastructure or other growth facilitation the Trump administration promises will take more than a few months to meaningfully impact domestic GDP growth. I have included a year-to-date chart of the DXY (US Dollar Index) below for your reference. Some are now calling for a potential “major” turn in the USD in the second-half as it is nearing its average bull-run-time of 7 years. Morgan Stanley expects Emerging Markets to expand at 4.7% this year, which I think is conservative for that particular exposure and further supports the potential for USD depreciation into the final months of 2017. What’s more, hedge funds and other speculative investors, according to the Commodity Futures Trading Commission, had $28 Billion of bullish USD bets late last year, which has declined as of June 27th to only $2.7 Billion. Lastly relating to USD, GDI clients that have strategic exposure to inflation hedges through holdings in precious metals and other commodities, I will remind you that USD decline generally equates inflation pressure. Though gold is less of a hedge than in years past, it remains a solid alternative to holding cash in a specific currency and generally moves inverse to inflation rates domestically, which erodes most other asset returns. RealAssets Adviser Magazine suggests, “Given implications for declining intrinsic values of U.S. financial assets, as well as ongoing Fed efforts to debase outstanding debt obligations, gold remains a mandatory portfolio asset”. The conclusion I would like readers to arrive at is that the benefits of being invested in a globally diversified and strategic portfolio and being exposed to solid global exposures both locally and abroad, makes a weaker USD a benefit. Exposure considerations are primary in every investment decision I make and the next few years will highlight the benefits of that approach. I have included a graphic below sourced from The Wall Street Journal, which illustrates the returns of numerous asset classes during the first-half of 2017. This can provide guidance on couple of levels including identifying holdings to add moving forward, as it displays what may be overbought and what may now be discounted from a historical perspective. It is also helpful when comparing the first half returns to your own holdings. I will note, however, that when doing that please remember that diversification and risk management processes provide meaningful benefits to the portfolio, and does at times result in a cost. Basically, if we were 100% exposed to Wheat to obtain that 24% return, we could have just as easily exposed 100% to Orange Juice for the -36.5% return. Finally, the S&P 500 is up nearly 18% since the election and the index just hit a new, all-time high in recent weeks. How long can these lofty values continue? God only knows, but we remain disciplined and prepared here at GDI headquarters. Lastly, regarding real estate, RealAssets Adviser magazine reports Home prices rose 5.8% YoY and are about 40% above the lows from the housing crash. GDI has begun focusing on adding alternative investments for qualified clients in the diligent search for non-correlated returns. REIT’s and other real estate exposures can provide the benefit of stabilizing returns and mitigating risk for some. Please reach out to me directly to identify parameters and discuss risk management protocol if you are interested in adding alternative types of exposure(s). The following is based on both first half realities, and the prospect that there are a few different paths the markets and globally exposed portfolios may take as we close 2017. Stagnation, which is lower Treasury yields, slow growth, declining inflation and defensive sector outperformance has started to replace the word reflation (the idea that economic growth is going to accelerate in the future) in a few of the publications I read regularly. Reflation is generally characterized by better growth, higher yields, higher inflation and cyclical sector outperformance. Having said that, there remains relatively stable support for the reflation “camp”. Black Rock recently reported that they, “Believe the current cycle won’t die of old age any time soon” and “The economy still has slack for the recovery to chug on.” They went on to assert that “A sharp earnings recovery is supporting equities globally” and that they “Favor markets outside the U.S”. I agree. Other economic indicators, such as the Institute for Supply Management Manufacturing Purchasing Managers' Index ("PMI") which tracks the sentiment of purchasing managers across the U.S. manufacturing industry, rose to 57.8 in June. This is reported as the highest level in nearly three years and is an increase of 2.9 percentage points from the May reading of 54.9%. Additionally it is at its highest level since August 2014 when it registered 57.9%, indicating growth in new orders for the 10th consecutive month. Something that has not been discussed much by the talking heads in the financial media recently is the debt ceiling and potential for a government shutdown coming in October. The debt ceiling will need to be increased by early October and another spending bill will need to be passed or the government risks another shut down. Because Republicans control Congress and the White House, the odds of a shutdown are relatively low, however, if they wait until the very last moment to do both, it will very likely result in some market volatility. But remember, volatility and/or a deep correction provides an opportunity to add solid strategic assets to the portfolio and I will be presenting clients with just such opportunity should this occur. Global index provider, MSCI, announced they will include Mainland Chinese equities (A-shares) tracked by the MSCI China A International Index to their Global Standard Indexes starting in May 2018. These indexes include the MSCI Emerging Markets, AC Asia Ex Japan, and ACWI Indexes. Upon full inclusion, which some experts suggest could take up to five years, the securities tracked by the MSCI China A International Index should grow to represent an additional 17% of the MSCI Emerging Markets Index. Krane Shares reports that “This should bring China’s weight overall (including Mainland, Hong Kong, and US listed Chinese stocks) to over 40%.” The impact to GDI managed funds is that it may translate to several hundred billion dollars of inflows from both active and passive managers into Chinese equities, pushing values much higher in the coming years. The Fed meets again in mid-September and much of the recent meetings have resulted in a stable rate policy combined with a bit more “hawkish” tone on inflation. The likely outcome will be that they continue to reduce the size of their balance sheet and watch inflation indicators closely for any prompting to increase rates. The risk is that if the Fed becomes more aggressive than expected at removing easy policy and raising rates, the markets could sell off in another “Taper Tantrum”. I look for much of the same as it relates to the Fed and barring any huge movement in inflation, or a nasty “tail-event” economically, rates will be ratcheted higher and all policy will be communicated as such. There is significant potential for market-moving events as we close 2017. Everything from an ongoing healthcare debate, to a government shutdown, to a new tax plan that may or may not be presented to the legislature, to a North Korea mess or intensifying Russian relationship tension, or an overbought S&P, or a hawkish Fed, or even a Trump Administration hiccup. Each of these, and many others I did not mention, would impact holdings on a multitude of levels. In times like these there is a quote from Warren Buffet that replays constantly in my head. He states, “Be fearful when others are greedy, and greedy when others are fearful”. Remember that we could also have a status quo market maintenance plan as we close 2017. Some have been speaking of a bubble for a while now and one has not really materialized. Remember, bubbles usually occur when most everyone begins to ignore the signs associated with their existence. We know for sure that there remains large amounts of liquidity chasing a higher level of returns due to low rates. Many investors may take all of the above risks and file them away for another time, which leaves us on track for continued stable returns as we end 2017. As a year full of unexpected economic and political results comes to an end, there is an increasingly focused effort to uncover what investors can likely expect for 2017 and beyond. What’s more, in 2017 investors are faced with not just the traditional market-related concerns like portfolio risk and return, but also regulatory and geopolitical issues that will ultimately create an additional layer of uncertainty around performance, risk and portfolio management as a whole. Based on a diligent focus on gathering an accurate perspective from the hundreds of documents I have read in recent weeks, the following will hopefully provide you with a solid outlook on what can be expected for 2017 and the years that follow. To say that the US equity markets have responded well so far to the Trump presidency is an understatement. The prices are fundamentally the result of the expected economic benefits of Trump’s fiscal, tax and infrastructure plans. The market perceives that this will be the proverbial “shot in the arm” that the US needs to finally shake of any remnant of negativity from the Great Recession. I would like to remind each of you that market participants tend to overreact to both good and bad news in the short-run, and this recent run up in pricing is no different. The fact is, fiscal and monetary stimulus and/or affects happen gradually over time and if history is any representation, they take extended amounts of time to work their way into the broader growth picture. Sometimes the affects take years, or multiples of years to be realized. The market has seemed to price a good portion of them in already and everyone is now getting excited about Dow 20k. I have a couple of questions for you to consider. First, do you believe that these prices are the result of realistic expectations? And second, will the occurrence instigate a greater potential for volatility in coming months? My answers to both of those questions are no and yes respectively. This is what prompted the recent GDI sale of high price-to-earnings ratio assets. This was performed in order to lock in gains that have a risk of running away early next year and to create a cash cushion to exploit new opportunities that will come available in the coming months. I have included a graphic below which supports the reasoning behind liquidating the small portion of assets. From a price-to-book perspective, only US large and small caps are above pre-crisis levels. This is an indicator for me that those instruments have become “expensive” on a relative basis. Additionally, we will undoubtedly face higher rates in 2017, which will impact US companies meaningfully. LIBOR, which is an index used for a good deal of corporate borrowing costs, is at its highest since 2009 and is very likely going higher. As leveraged companies face borrowing cost pressures, some may then face painful capital constraints, which could impact earning potential for years to come. Even when the previously described potential economic boosters from a Trump presidency are taken into account, 2017 will likely resemble 2016 in terms of US growth. Many expect GDP growth to remain at around 2% for the year. Basically, the aforementioned boosters may not even be felt for the first time until well into 2018. It is suggested also that the fiscal impacts of Trump’s plans could yield around 1% of GDP growth at the best case, and when that is combined with the reality of a large amount of baby boomers retiring and a declining productivity picture, any real positive impact, according to JP Morgan, would be hard pressed to pass 0.5%. Additionally, outside of the US, global growth is under pressure from aging populations, weak productivity growth and in some places, excess savings. If you are genuinely interested in digging into how each of these affects growth prospects, and impacts the GDI portfolio management methodology, I am happy to discuss the topic with you personally. Regarding inflation and interest rates, we face the prospect of a new normal, that is not really “normal” at all. Rates have trended higher recently across the yield curve and have done so rather quickly. Additionally, we finally face real inflation pressures and the Fed’s preferred measure of inflation, as well as broader wage inflation are steadily increasing. Having said that, the Fed expects that it is very likely the level of inflation will remain around 2%, or just slightly higher for the year and they are acting accordingly. As a reminder, 2% is where the Fed tries to target inflation as it is their assessment that it is at that level which contributes to growth without being overly cumbersome to spending and economic growth. The US Fed has raised rates at their last meeting and are suggesting that two or three more increases will be realized in 2017. Though some feel a bit of worry about this, the broader point I would like to make revolves around not just the increases or the velocity of increases, but where interest rates need to get to in order to resemble “normal” from a historical standpoint. Though the 10 Year UST yield has gone up considerably in recent weeks to around 2.60%, it remains well below the 2007 yield of 5% and the 20-Year average (See chart below) of 3.94%. Though rates will go up along the entire curve, they will very likely remain relatively low compared to history, as “normal” is still a long way from here. Rates in other parts of the world, namely parts of Europe and Asia, display a very different reality. As some of you may have heard, negative rates exist meaningfully in the world, and not just in small pockets of issuers/countries. For the sake of stimulus and “easy” policy, some of the world’s central banks have taken rates negative in order to incentivize investment and disincentivize holding cash. It is reported that over $10 trillion of holdings are currently priced at negative rates. There is still uncertainty surrounding how effective these policies are in terms of stimulating growth, however there is very little argument from anyone that it puts a great deal of pressure on investors to find earning assets that outperform inflation, let alone other market benchmarks. Before Trump was elected, there was a great deal of chatter about the risk of stagflation here in the US, which is basically inflation without growth. Though the prospect of stagflation has not been completely removed due to significant hurdles around the president elect’s plan, the likelihood is diminishing more and more everyday. Now that he was won the election, those same authors and commentators are now leaning toward the reflation camp in 2017. Reflation is where growth, earnings, inflation and stock prices all move up at the same time. Based on the proposed tax cuts, the repatriation of offshore taxes, decreased regulatory pressures, infrastructure spending and improving stability in the Eurozone, reflation is more of a potential than at any time in recent history. But as mentioned in my opening comment, this will take a good deal of time to be realized and there are significant risks to that outcome (Detailed in the “Key Risks in 2017” section below). Portfolio allocation considerations, including diversification and expected returns will also be very similar to those implemented in 2016. Though we face many new uncertainties in 2017, we can expect a few things with a strong level of confidence. We can expect 1. Higher Rates 2. Higher inflation and 3. USD volatility. Considering these, strategic exposures to instruments that are well placed in that environment are key. As a GDI client, you are provided with a detailed portfolio structure that accomplishes this, as well as fits your unique financial realities. I am happy to discuss specific holdings and investment strategy with you personally as providing investment advice is not what this commentary is intended for. I have included a forecast from State Street Global Advisors below, which supports the broader GDI allocation mandate. This mandate is driven by the goal of obtaining exposure(s) strategically at a time when the market is discounting (or hating in some cases) them and then realize gains when exposure(s) become over-valued (20 times earnings or higher) in order to hedge against the likelihood of a correction in that exposure(s). Geopolitical risks resulting from growing global populism and the uncertainties of a President Trump impact on broader US and international trade relations. There are risks to growth, and even a potential for a credit default epidemic due to the impact to companies and the consumer from the continuing rise of interest rates. Corporate debt as a percentage of GDP is relatively high compared to recent years and TransUnion recently came out with a statement suggesting they expect credit card default levels in 2017 to resemble those realized back in 2009. The risk that Trump’s corporate tax reform may not become reality, which will undoubtedly impact US companies (and investors) negatively. A “hard” Brexit and/or Ita-leave. Both of these driven by financial and economic realities in the Eurozone that are putting serious pressure on capital. If the Eurozone begins to really become unstable, a positive outlook can become neutral, or even negative very quickly. The DOL Fiduciary rule, which has placed a greater level fiduciary responsibility on all investment advisers, especially those that provide advice for retirement assets. This has the potential to motivate advisors to build “cookie-cutter” style portfolios which include assets that do not require the extensive amount of justification and client engagement the rule necessitates. This is not as big of an issue for GDI clients, as each has a specific strategy and detailed proposal for action, although it provides the potential to pressure some assets and the broader business as a result. There are also some suggesting that a President Trump will reverse or minimize some of these cumbersome new regulatory realities, however, many of us in this business are approaching these rules with the highest level of scrutiny and compliance. 11/01/2016 - Election Day in the US is Coming! Pervasive uncertainty and volatility in the markets can cause many investors to increase the intensity of worry relating to the future value of their investment holdings. Though GDI clients are well-diversified from a broader perspective, we are approaching what Mr. Arone from State Street called “One of the most dichotomous US presidential elections in history”. There is some suggestion that a Trump victory would upset the markets much like the way Brexit did just a few months ago. Based on this assertion, and many others you have likely heard or read about recently, I have provided some high-level guidance below. First, I would like to highlight what happened after some time passed beyond the Brexit vote. All of the fear and selling resulted in investors recognizing losses on assets that ultimately came back to their pre-Brexit valuations. Some holdings, in fact, began to perform better as savvy investors (GDI clients) were strategically exposed to diversified holdings in just such assets. This is very likely the same reaction and result we will experience should Trump become President. The reality is, assets are priced based on expected value and even if that is skewed by market participants for a period of time, most assets return to “fair-value” based on the future expectations of those particular holdings. What’s more, some assets, such as metals, energy, financials and housing are suggested to potentially outperform in a Trump presidency. Most are suggesting that the reason a Clinton victory would not upset the market relates simply to the fact that she is viewed as “more of the same” in relation to the current administration, and that outcome is already “priced in”. There is also the uncertainty surrounding the outcome(s) in Congress. All I can say about that is that in 7 days, we will know the reality with a high degree of certainty. But again, worry adds nothing but preparation, diligence, discipline and strategy adds value and understanding. Second, many of you have listened and implemented my fundamental approach and conclusions about investing over the years and have experienced stable, risk-managed and often times superior returns as a result. I will simply state that even though the upcoming volatility from the uncertainty of the presidential and other elections might be extremely uncomfortable, please remember that the pragmatic, value-based and diversified approach we have implemented in previous years continues to be the soundest approach for medium-to-long-term returns going forward. The global economy is expected to grow, the USD continues to face depreciation pressures, and many hated assets of late are showing lasting signs of appreciation through 2017. Lastly, I remain available to chat about your portfolio, the markets, or anything else for that matter. I read a multitude of commentaries on a daily basis and establish positions in the market according to strategic implementation of risk factors and overall return expectations. If you want to know the details about any market or exposure, I would be most happy to chat. Until next time, Position Globally, Allocate Conservatively, and Invest Completely. Brexit? What will it mean for the markets? Some of you may be wondering what the so called "Brexit" vote happening in the UK this afternoon/evening (our time) will have on the global markets and to your GDI-managed portfolio specifically. I will start by saying that this particular referendum vote in the UK has the potential to be one of the most significant market movers we have seen in a very long time. The reason for the market volatility potential relates primarily to the significance of disrupting the status quo of the UK being a member of the European Union for four decades. There is just too much uncertainty around will happen to the broader economy of the UK, the EU and the rest of the world for that matter, if they vote to leave the EU. And as we all know, the markets to do not like uncertainty in any form and a "leave" vote will cause declines in just about every asset outside of safe-haven holdings. (Every GDI client owns a sub-set of safe-haven assets as a hedge). I will not bore you with the political details of the Brexit, however, I will state that the fundamentals around the Brexit referendum relate to the battle between two things: 1.Economic well-being and 2. Immigration reform. The EU allows for an immigration process that is very lenient and citizens of the UK are fed up with it. What some of those voting in this referendum do not comprehend is that sacrificing economic wellness for immigration reform is draconian at best, and deadly at worst. The reason they do not comprehend this relates to the basic characteristics of those voting to leave. Usually they are young, with very little assets and care more about making a political point than about damaging the economy. I will close by stating that as it stands, there is only about a 30% risk of a "leave" vote, which is not enough certainty to liquidate assets ahead of the vote. Also, you must remember that if the assets are chosen based on sound fundamentals and value, a price decline due to fear is not a quality reason to sell in the short-run. I recommend weathering the storm of a decline as GDI-managed portfolios are diversified and hold sound assets meant to provide value in the coming years. If the vote is to "remain", we will recognize continued appreciation in the portfolio values that we have seen in recent weeks. US Dollar (USD) value, when compared to other global currencies remains under pressure as we conclude the first quarter of 2016. Many of the fundamental domestic and global economic conditions described in GDI’s publication of A Case for Portfolio Rebalancing late last year are quickly becoming a reality. The conclusion that can be drawn is that those GDI clients that engaged in proactive portfolio rebalancing late summer 2015, mitigated losses on many exposures and are now beginning to see outsized gains in a subset of the rebalanced portfolio. To represent one particular segment of rebalancing that included strategic exposures, I have included a graphic of the S&P World Commodity Index below. The image below displays that the index has turned positive and has been moving higher in the last couple of months. The 20 Day Moving Average is represented as the red line and also displays a trend toward higher values by its shape. The USD has declined and stabilized over the last 6 months, though remains under pressure for continued decline due to the technical realities (see graphic below) and the outstanding USD that was created from the large levels of USD printing by the Federal Government after the Great Recession. Even with the Fed on a tightening path where they have recently raised rates, there continues to be increasing chatter about wage inflation, which is a significant component of broader inflation pressures. As USD declines, and inflation increases, the strategically rebalanced assets will outperform compared to the broader market as we enter mid-2016. The chart below displays the US Dollar Index, which measures the USD against a basket of global currencies. Note the red line, which is a 200-day simple moving average. From a technical perspective, prices generally revert back to averages when looking over medium-to-longer-term. USD remains nearly 10% (15% late last summer) above its 200-day moving average as represented in the DXY. As expected, last October, the IMF approved the inclusion of the Chinese Renminbi/Yuan (CNY) into its basket of currencies in the enviable position of “Reserve” currency status. This coming October 2016 is when the inclusion becomes fully active and most market participants are not clear on what the real outcome and broader market impact will look like. The GDI rebalancing was designed to hedge against the risk of a broader sell-off in USD. Enable another alternative global power to take a percentage of its “market-share”. Will China take a significant portion of the reserve currency transactions in coming years? China recently overtook the United States as the world’s largest economy in terms of purchasing power (IMF reported) and a great deal of business is done between China and the rest of the world as they are the number one exporter in the world. There will very likely be at least a 10% change in USD reserve levels compared to CNY as we end 2016. The outcome on USD remains uncertain overall, however, as a GDI client, you are prepared to weather the risks associated with a broad spectrum of outcomes. 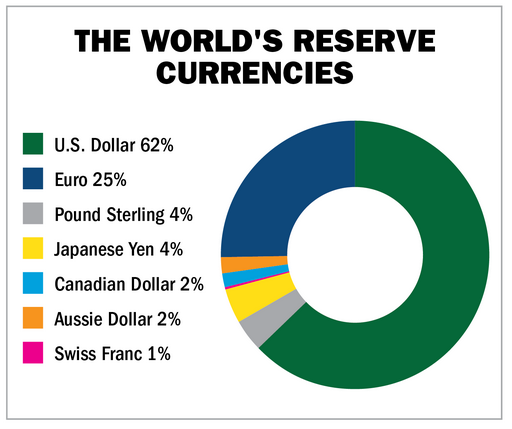 The US Dollar has maintained its dominance as the primary reserve currency for a very long time and the idea that confidence in China will match that of the United States is short of ridiculous, especially given the recent equity and real estate market realities there. The confidence in a “managed-floating” currency, which CNY is, compared to a free floating currency such as the USD is a two-edged-sword. On one hand the value is stable, but on the other, the value may not represent the true economic conditions and could limit the upside for investors holding CNY and CNY investments. It may just be too much trouble for large global organizations to update their policies and procedures in a timely manner in order to accommodate the CNY as part of their ongoing financial operations. This could delay the incorporation of CNY into the broader global economic landscape. As expected, many of the investment holdings that were rebalanced to are up by multiples of % since they were purchased. There remains a good bit of distance to cover still and this initial appreciation of values is a small indicator of what is likely to come. US Dollar (USD) value, when compared to other global currencies, is under pressure as we close 2015 due to changes in fundamental domestic and global economic conditions. Those pressures could very likely become more intense as we close 2015 and portfolios should be rebalanced accordingly. There remains a relatively low risk for a “crash” scenario for global asset values, however, a proactive portfolio approach to a declining USD is paramount. Premise ONE: The USD has been under pressure for decline over the last year due to technical realities (see graphic below) and large levels of USD printing by the government after the Great Recession, as well as a looming threat of inflation. 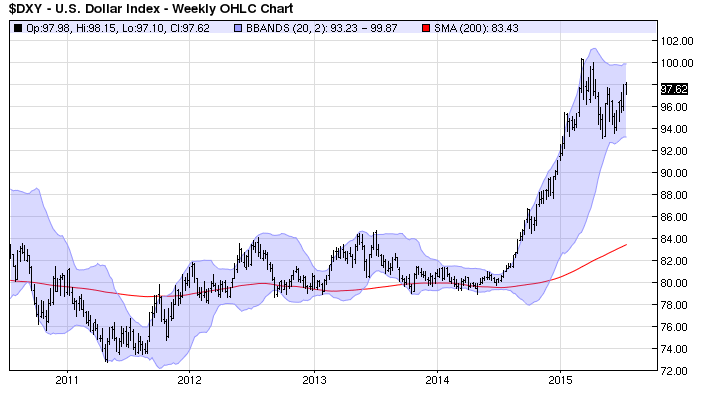 The chart below displays the US Dollar index, which measures the USD against a basket of global currencies. Note the red line, which is a 200-day simple moving average. From a technical perspective, prices generally revert back to averages when looking over medium-to-longer-term. USD remains nearly 15% above its 200-day moving average as represented in the DXY. Premise TWO: In October, it is reported that the IMF will be considering, and very likely approving, the inclusion of the Chinese Renminbi/Yuan (CNY) into its basket of currencies in the enviable position of “Reserve” currency status. Will China take a significant portion of the reserve currency transactions in coming years? China recently overtook the United States as the world’s largest economy in terms of purchasing power (IMF reported) and a great deal of business is done between China and the rest of the world as they are the number one exporter in the world. It is also reported that largest cell phone companies there has more subscribers than the entire population of the United States. The evidence points toward at least a 10% change in USD reserve levels compared to CNY. The details below are used to establish a basic framework and display which assets perform well in USD depreciation scenario. Note that each GDI client will have the opportunity to evaluate and approve their individualized portfolio plan using this and other pertinent data. The information provided is simply a guide for how to approach successfully preparing portfolios for the very real potential for USD depreciation. 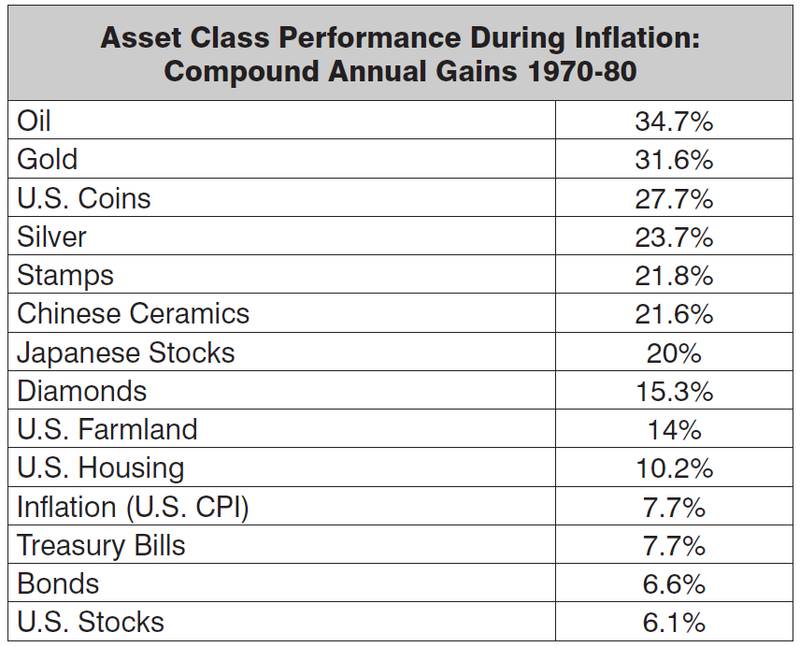 The asset classes below performed the best in the previous USD devaluation of 30% in the 1970’s. Jobs, growth and inflation numbers are keeping the potential open for a U.S. Fed interest rate increases as early as September. There remains reasonable arguments for the Fed to start tightening policy at that time, however, there is also a risk to the markets as we close 2015 (more on that later) that could easily delay any tightening. Fed Funds Futures are now pointing toward Q1 2016 for the first tightening. The data in the next few months will ultimately drive the timeline. The US Dollar has been trading relatively high against a basket of foreign currencies in recent months and remains “at risk” for devaluation based on technical indicators such as Moving Averages and interest rates. What this means for our portfolios is the Emerging Market and Commodity/Energy components will outperform should the USD decline. This is also very data dependent and is top-of-mind here at GDI. Risks for volatility as we close out the second half of the year is reasonably high. There are some market participants that are calling for a drastic decline in market values in September/October 2015 due to extenuating circumstances around the world and historical statistical analysis. I remain committed to a fundamental strategy of diversified holdings in our portfolios and want you to be aware that any drastic pricing declines are driven by emotions, and not by fundamental considerations. If our portfolios lose value in those months, we will remain invested and well positioned for fundamental returns in the following quarters. If you feel strongly about removing risk from the portfolio (which also removes potential for return), please contact me soon. The last few trading days have provided all of us with a heavy dose of unwelcome volatility in asset valuations. This update is intended to provide you with some additional detail in order to help make more sense of what is actually going on. I will first state that that a certain amount of volatility was expected due to where we find ourselves in the recovery timeline. We are six years into a decidedly bull market which occurred after the most painful recession since the Great Depression. What's more, after a few years go by in any recovery the broader market simply doubts the potential for continued positive growth. I would like to highlight, however, that even though the broader market is pessimistic about opportunity and growth, I am not. All the talk of bubbles makes me, well, crazy. In order to have a bubble, most participants will be irrational and overly optimistic about numerous assets. We do not have that, at all. As represented in prices recently, many participants remain very fearful and pessimistic and my guess is most people you all talk to feel similarly. It is when everyone feels great about the market and starts to buy things they cannot afford that I become worried of bubbles. Secondly, the recent declines in the markets are related to stronger jobs numbers and an improving U.S. economic picture and the reaction of the Fed to interest rates. Now does that make sense? The way I make sense of it is explaining it like a cocaine addict having their cocaine taken away. They don't need it to survive, and they will undoubtedly be healthier without it, however, will they let you just take it away? No, and the market is not happy about the Fed taking away the super cheap money that has been made available for many years now. Third, the U.S. Dollar is moving higher, which only improves the inflation landscape. Basically, the U.S. Fed has a dual mandate, where the primary objective is inflation control (like most other global central banks) and secondary is the improvement in jobs and labor to the level they describe as "Full Employment", which is where it is now at 5.5%. So as the U.S. dollar strengthens, inflation pressures are eased. As it weakens, inflation pressures increase. Right now inflation is at the Fed's target of ~2% per year. The Fed will very likely increase rates this year, we just don't know when. In conclusion, I would like all of my clients to understand that the fundamentals around growth here in the U.S. and globally remain positive. Though the Eurozone and parts of Asia are experiencing a few negative economic pressures, the world is improving overall and the diversified portfolios we are all invested in will benefit longer term as a result. The world will continue to buy things, use energy and invest their earnings into the markets, into their businesses and/or into education. All of these things are positive for our portfolios as we are invested for the medium to longer-term. Don't let the recent market declines and volatility get you down as it is temporary. Most of you have done extremely well in the beginning of 2015 and as long as no major bad news like wars etc. are released, there is no doubt those values will return in the next few months. The title of the 60’s movie, The Good, the Bad and the Ugly has been historically used as a tool to describe situations with varying outcomes that occur over a certain time period. I will continue in that tradition in this commentary in the hopes that it provides you with some much-needed clarity. The “Good” is the easiest to describe since there has been more good than bad or ugly as we start 2015. Global markets have performed well over the last year as the S&P 500 is up over 12%, the DAX in Germany is up over 17%, the FTSE (UK) is up 4.5%, and considering the deflation issue and currency issues in Japan, the Nikkei is still up nearly 25% Year-over-Year. Non-farm payrolls and personal incomes have both showed signs of improving and we have realized some of the best readings in jobs numbers since the late 90’s and early 2000’s. Oil and fuel (until this week) have both come down significantly in the last year as oil remains 40% below year-ago levels. Industrial production was also reported to be up nearly 5% and Durable Goods just over 7% for the year and inflation, as measured by the Producer Price Index (PPI), was down nearly 1% in January alone. I will qualify that statistic by stating that gasoline prices were down 24% for the month and likely had a favorable impact on producer costs overall. Though I do expect continued volatility in prices in the coming months, I remain optimistic about overall global growth and market gains through the remainder of 2015. The “Bad” can be mostly attributed to the price decline and resulting volatility of oil and oil and gas related holdings over the last few months. The velocity of the decline of oil prices created a heavy sell-off in a lot of different assets, even those not related to oil and gas. Remember, markets are representations of human behavior and that, as I have mentioned many times before, can be boiled down to the struggle between fear and greed. As I stated in my December commentary, I have and continue to take advantage of price declines in this sector by strategically adding exposures. The “Ugly” relates to rising geopolitical risks and the broader economic uncertainties that stem from them. The tensions between Russia and Ukraine have only gotten worse and the recent decline in oil prices could further affect other oil producing regions from Latin America to Africa. What’s more, terrorists are displaying their unrestrained passion for death and destruction by beheading individuals from all countries and all walks of life. A major terrorist related occurrence would undeniably affect markets and pricing of assets. The uncertainty can be overwhelming, however, with GDI’s focus on diversification of assets if an uncertainty became a negative reality, the impact to portfolios should be mitigated. Clarification on the recent happenings in the global markets and guidance on what to expect for the end of 2014. The most significant occurrence in recent weeks relates to the pricing of oil and other energy related investments. Crude is trading at just above $60 per barrel, which is the lowest it has been in years and some are expecting the prices to continue to decrease through the end of the year on no supply adjustments from OPEC. This has also created some debate as to the relative benefit to the global economy and to the U.S.'s growth rates, inflation and Fed decision making. I will simply state that a lower household expense on fuel will likely turn into a bit more spending (70% of US GDP), however, I do not expect a large improvement due to the affect of other inflationary pressures that exist. The markets are trading lower recently on the oil and energy sell off. There has also been some not-so-great news out of China and the Eurozone that is pushing markets lower as well. I remain optimistic for 2015 overall and I continue to be fully invested in the GDI framework through this discomfort. What all of this has done is create a broader "unloved" category in the GDI framework, which coincidentally acts as a terrific opportunity to buy some of these great holdings at really low levels. And that is exactly what I have been doing in recent days. I have purchased holdings across many GDI portfolios that have capacity to extract value from the Energy/Commodities category of the GDI framework. (Please never hesitate to call me to discuss exactly what I am doing for your portfolio). In conclusion, I want to reiterate that I buy companies and exposures based on the view that a diversified global framework will provide stable value and minimize the risk to losses over the medium to longer-term. Though my experience and wisdom enabled me to conclude that the recent correction was temporary, there is always a sliver of doubt that puts a bit of fear in me during heavy days of market selling. I am happy to report that in spite of the sell off in markets in the last few weeks, today is no where near as scary as some thought it would be (Scary Halloween costumes not included in this analysis). Markets have now regained reasonableness and I continue to look for a solid close to 2014 and a sound beginning of 2015. Given the removal of "QE" by the Fed as of yesterday's statement, I look for the Fed to start raising interest rates after Q1 2015. That will likely bring a bit more volatility in prices, though do not forget that the Fed only raises rates in the face of inflation and an improved economy. Have a safe Halloween and if you have any questions or would like to discuss your portfolio and where it stands as of today, please never hesitate to call or email me. This third update for October finds us all in a much improved spot when compared to just two weeks ago. As I mentioned in my last report, I simply could not find any reason for the excessive selling we experienced in the last month. Most economic news, though not stellar, remained positive overall. In some cases, the reports revealed positive statistics we have not seen in years. As of this morning we have regained nearly half of what was lost in the major indexes over the "correction" period. For those that were not fully allocated to the GDI Asset Allocation Framework, I took the opportunity to buy some holdings at those very low levels. That move, as of today, has proved to be quite beneficial overall. I hope that the market volatility did not cause too much stress for you. Please know that I am diligently evaluating each portfolio in the care of GDI every day and I am happy to discuss strategy with you should you desire. Lastly, I myself feel much better that the market has regained its sanity and I continue to look forward to a positive Q4 and 2015. I know many of you are connected to the news and may have additional questions regarding today's market decline. As always, NEVER hesitate to call me to discuss markets or your portfolio. I will note that nothing has really changed fundamentally since my last email, other than the fear-factor has gotten worse. Some are suggesting that the market has moved from fear to panic and when that happens, I am a buyer. That's right, I have been buying all morning as I am leaning toward the conclusion that this is, or at least is close to, the bottom of the aforementioned "correction". How do I reach this conclusion in such rough markets you ask? The fundamentals for global growth, US strength and overall stable returns remain in-tact. Jobs numbers are improving, inflation is at or below the Fed's 2% target, and US and global growth is positive and is forecast to remain that way well into 2015. What's more, 50 of the S&P 500 index companies are releasing earnings results this week and as Bloomberg.com puts it, "Profit for the members of the index probably rose 4.8 percent in the third quarter and sales increased 4.2 percent". Lastly, and not to diminish the short-term affect of any portfolio losses, it was reported today that Hedge Funds (the big ones) are facing losses of around 16%. Not one of GDI's clients has faced losses anywhere near that and some remain positive for the year. I am looking forward to an improved Q4 overall, once we get through October of course. Until next time, Position Globally, Allocate Conservatively, Invest Completely. As you have likely noticed, the markets have been even more volatile in recent days. The S&P 500 Index, for instance, was up nearly 2% yesterday and is down again by that same amount today. The primary reason for this relates to shrinking, though not recessionary, global growth expectations (China and Europe) combined with an increasing uncertainty as to when the US FED will start raising interest rates. The VIX (Volatility Index) is reported to have jumped 24% just today. The purpose of this update is to reiterate that this volatility is a short-term reaction to a decidedly optimistic longer term outlook. Basically, since 2009 we have experienced the largest US expansion in history. On top of that, rates continue to be low and expectations for growth are moderate, which only potentially extends the expansion process. As I have told many before the markets are driven by two things: 1.Greed and 2.Fear If either of those have taken over, the volatility will commence. We just don't notice is as much in times of greed. But as soon as the greed takes over and everyone is happy, that is when I really start to be concerned. The markets continue to live in fear due to the largest recession in US History being still only a few years ago. In spite of the recent declines in expectations, global growth is still expected to be over 3% in 2014 and will likely be higher in 2015. Keep in mind also that the unemployment data today was also positive, bringing unemployment to the lowest level in 8 years. If we can take these lumps and maintain a levelheadedness in all of it, each and every portfolio will ultimately be rewarded. 2013 presented investors with a mix of subdued optimism, latent uncertainty as well as some not-so-entertaining US Fiscal policy “Stuff”. For the most part, the outcome has been positive as the global economy continues to heal from the worst recession in history and equity indexes increased by percentages not seen in many years. The Standard & Poor’s 500 Index was reported to have posted its largest annual advance since 1997, rising nearly 30% and the Dow was up 27% for the year. For all of my clients that are invested in the GDI Asset Allocation Framework, we have performed well in 2013 and are expected to improve on that performance in 2014. The primary reason for this relates to the disciplined exposure to emerging markets and commodities, which both have positive outlooks for 2014. Though many suggest that global equities will increase in value less in 2014 compared to 2013, there is just as much support for a broad improvement in emerging market and commodity related returns. As we head into 2014 I look forward to building GDI further and I am sincerely thankful for all of the support my clients have shown to my vision over the last few years. This year will be an exciting year for GDI as I transition full time to running my firm and further exploring opportunities in business and the global markets as a whole. The topic that has gripped market participants in the last couple of months has been related to the when and how the Fed will “taper” off its stimulus that began as a result of the Great Recession. Depending on how you are positioned, the return of volatility to market valuations has either created an opportunity for you or just simply resulted in, for lack of a better reference, indigestion.In any case, the things driving the Fed to consider tapering are tied to improvements in jobs and in economic conditions.And when you consider the broader declines in equity valuations and increases in interest rates that occurred when that news was released, it can be a bit confusing to say the least. When things are getting better, prices should go up right? Well, sort of. To explain last month’s declines in equities and increases in rates across the yield curve I will need to unfortunately use the reference of a drug addict. I am not by any means being insensitive to the realities of addiction and have dealt with its negative outcomes in my own family over the years. What I am doing is explaining what occurred last month with the most appropriate analogy I could think of. You see, the market has been “getting high” on cheap money and easy liquidity over the last few years and just like an addict, when you help them get healthy and they no longer need the drug, they have a hard time grasping that reality. The markets are the same way, even though things are better (healthier) they still want the cheap money and easy liquidity. Who can blame them I guess? The problem relates to the fact that if that cheap money and easy liquidity sticks around too long past it being needed, rampant inflation and other asset bubbles can quickly become a reality. Though in some cases rather slow, economic and business conditions continue to improve and I think it is healthy for the Fed to address the inevitability of tapering stimulus early rather than later. Lastly, in the last few days we have received more clarity about what the timing and triggers of the tapering will look like and as a result, the markets have recovered reasonably well. The Dow closed above 15,540 and the S&P closed at 1680.80 yesterday. Higher volatility levels will likely stick around for a bit longer as the market digests what the Fed will do. The implications for the rest of the global markets are also less certain as flows in and out of EM are impacted. Overall, the fundamentals continue to point toward gradual improvement as BTM reports that in the US, Payroll jobs were on the “high-side of expectations”, rising 195K in June and were accompanied by a 70K of upward revisions to the April and May numbers. One thing to note is that the unemployment rate has stalled at 7.6%, though it has been declining about 0.7 percentage point per year since the recession ended and there is no hard evidence that this will not continue. Considering this momentum, Ben Bernanke has suggested that a 7.0% unemployment rate (or better) will drive the removal of QE. If we continue get positive jobs reports, that point could realistically be reached in early to mid 2014. Inflation has recently picked up a bit as AFP reports that “Producer prices for finished goods grew for a 2nd straight month and were up 2.5% from a year earlier. PPI for finished energy goods rose 2.9% in June largely as a result of a 7.2% jump in gasoline prices while those for finished food ticked up 0.2%.” If we get a spillover of this PPI into the PCE deflator, the Fed would be much quicker to raise rates. Even though the EUR is trading above 1.31 again, there remains inherent potential weakness in the Euro as we close out 2013. There continues to be significant financial issues in Europe that will, for an uncertain amount of time, resurface again and again. A commentary from Barclay’s states that those issues are the, “Same ones we were discussing last summer and little to no progress has been made to fix them.” One positive remains in the bond auctions of the countries in the region. Soc Gen reports that Spain sold 1.12bn EUR of 3yr bonds at an average yield of 2.768% compared to the previous auction which resulted in a 2.875% yield. As yields come down, there is less pressure on the countries within the Eurozone to find a source of cheap liquidity. The push to re-inflate the economy in Japan moves forward as JPY is trading at over 100.47. SCB reports that the MPC minutes show BoJ upgraded its economic assessment, saying the economy has been picking up and expected CPI to make moderate gains in future. Japan is focused on kick-starting their economy and after many years in low to no growth environments, who can blame them? This month's global economic and markets report includes far less commentary from me, and a whole lot more bullet points. The reason being that at my most recently attended global markets conference in NYC, there was an extensive amount of quality information dispersed and in order to make that information readable and easily digestible, I have simply included it in summary sections with bullet points below. As an introduction to the bullet points, however, I will simply state that the global markets during May continued to recover, albeit with a few hiccups along the way. Those hiccups were attributed to the usual suspects, though China, the Fed and news from Japan had the most impact overall. A well-diversified global investment strategy will create an ability to take advantage of broader themes as well as mitigate losses from what is widely described as "tail risks". U.S. equity markets rallied this month as the Dow hit a new all-time high of 15,542.40, the S&P 500 reached its new all-time high of 1,687.18, and the NASDAQ touched another 12 1/2 year high of 3,532.04. These indexes are all up over 21% over the past 12 months. 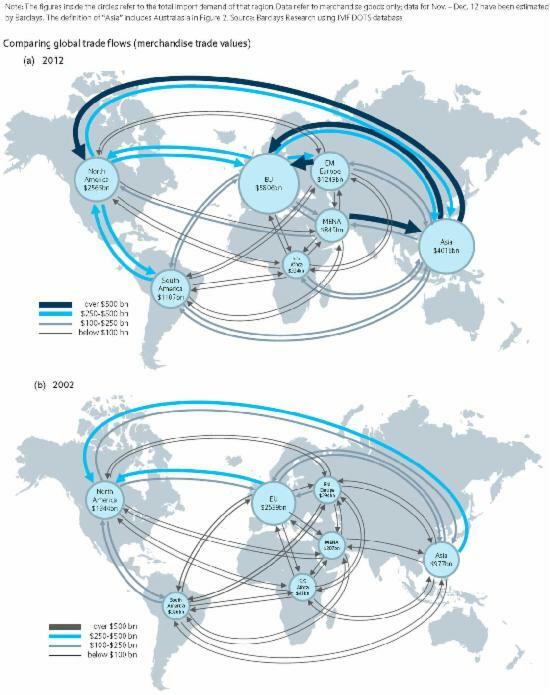 I will conclude my short introduction with some images which reflect global trade flows in 2002 compared to 2012. Since a picture is said to be worth a thousand words, I will leave them open for you to decide what they say. I am, however, prepared to use one word to describe them and that word is... opportunity. The G7 makes up less than 50% of the world economy and China, India and Indonesia explain most of the recent growth as urbanizations increase. ASEAN economies can easily achieve greater than 6% annual growth in the next few years. The world economy will be better in 2013 than in 2012 though the big risk is extreme interest rate increases. Hedge duration risk! The U.S. can emerge as an energy/power exporter through Natural Gas. There is over 14 Trillion in global Central bank reserves, "War Chests" that has changed the average export cover from 4 months to over 68 months. "Central banks can mitigate risk, but not create growth." Even with discoveries in the U.S. and lower oil prices, SCB thinks oil demand from China and India will remain strong as the middle class continues to grow. Bullish on Philippines and Dubai. Panelists not too concerned with deficit or debt in U.S., though the spending cuts will mitigate growth, ~2% projected. Bid for UST's will not go away and a 1.20% 10-Yr is possible. (2.18% today) Low inflation is the "Great Enabler". Correlations to overall global equity markets are becoming less significant in the Emerging Markets. EM needs to issue more bonds to meet demand and increase flows of debt. Opportunities: Debt markets. Brazil (1st time a Brazilian State issued debt, at a spread of 10bps to sovereign Brazilian debt, though still backed by Brazil). Brazil is attractive and relatively cheaper than other emerging. Chilean debt issued USD denominated. Frontier markets: Nigeria – Nigerian T bills, risks are mostly related to oil pricing. As volatility comes down, it favors the carry trade there. As U.S. interest rates rise, EM is impacted and as a result becomes less attractive. Spain vs. Mexico – "Spain should not be investment grade and Mexico's risk premium should come down". 80% of the world's middle class is said to be in emerging economies. Turkey will be "THE" economic power in the Middle East as there becomes more interest in the Black Sea Community as well as the fact that Turkey is viewed as successful within that region. 1.6 MM barrels of oil that were stopped from Syria was made up by North American production. U.S. is 20% less dependent on OPEC oil which allows for a lesser impact of Middle East Turmoil. China's interest in the Middle East, however, is growing. Bullish on Egypt overall as the Muslim Brotherhood is isolated and on IMF negotiations. China expected to overtake the U.S. economy in size by 2017 and the RMB is inevitably going to be a global reserve currency. Rebalancing is necessary as more of a focus needs to be on consumption (Services contribute 35% more to GDP than manufacturing). Price and interest rate reform should create more opportunities to invest. The liberalization of interest rates and an increase in household incomes are imperative. Privatization of banking sector necessary to facilitate alternative channels of raising capital (Bond market development). Social and moral problems WORSE than 10 years ago. Corruption continues and is higher than the GDP growth rate. Local government debt is a big problem. The 3-Year outlook for China was bearish. 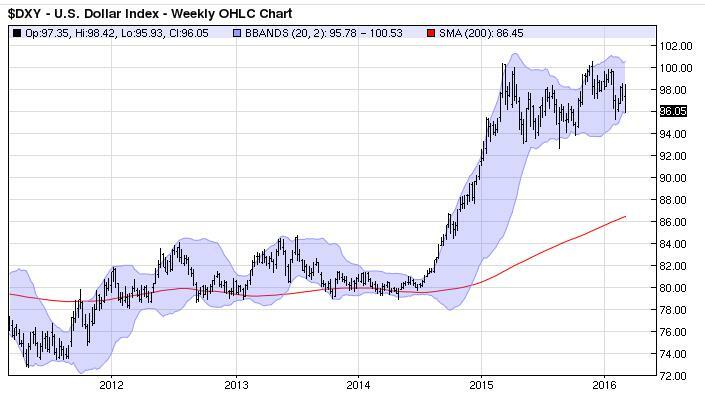 Japan the boldness in recent moves toward lower JPY and inflation is significant. 95% of Japanese consider themselves middle class and there is not a leadership culture. JPY 115/120 is possible. As Japanese fund managers reallocate holdings and birth rates go up that will be the signs of optimism. India "Incredible India" The good points: 1. Largest democracy 2. 1 in 6 people are Indian 3. GDP (PPP) 3rd largest in the world 4. Second largest workforce provider in the world with a growing middle class. The BAD points 1. Poor country overall 2. Infrastructure is weak 3. Growth "falling off a cliff" 4. Current account deficit growing (most important concern as the composition of flows is the focus. Import/export policies need to be invoked to foster improvements in the Current Account Deficit. 5. Banks are stressed. A mild improvement in the investment recovery will provide consumption growth in 2014. The reunification of Korea was mentioned and described as "very expensive". There was a question about who would pay for it and China was represented as the best likely candidate given that 70% of North Korea's needs are provided by China. ASEAN – Strength through unity is developing, regional economic approach. Asia ex-China approach. ASEAN securities, integrated with risk spreading. Monetary union without fiscal union WILL NOT work. It is a balance of payments problem, not a fiscal problem. The South has become more expensive and deficits have widened, when the opposite should have been occurring in order to foster competitiveness. Salaries are sticky and generally do not go down, as a result, a deflation focused approach does not work. Fringe parties will continue to grow and social unrest could get worse as 50% of the youth in Spain are unemployed and the South remains largely uncompetitive. Eurozone was described by all as the "Greatest Economic Risk", though there is a very low probability of it failing overall. Wells Fargo reports on Greece that, "Investors now demand only about an 8% yield on Greece government bonds compared to almost a 40% yield in early 2012! European fiscal problems remain and a regional recession persists but investor sensitivity to these problems has calmed as the perception of the eurozone crisis has moved from calamity to chronic problem". Structural Transformation as resource poor countries, such as Uganda, brings with it a growth in services. 2/3 of Sub-Saharan African workers involved in Agriculture. Region is working on land reform to go from smaller farming to large farming. Nigeria – Improving how oil and agriculture do business. South Africa – there are positive effects of education and infrastructure. Syria- Geography and relationship with Iran magnify risks, though impossible to price. Serious risk that Israel and U.S. cannot manage the nuclear risks from IRAN as there is not 100% buy-in from Israel. 2014 holds the risk of increased military action. Breakdown of contract between generations. An equalized fiscal policy for future balance requirements will require a 64% increase in taxes and a 38% cut in outlays. Elderly are consuming more than any time in history as 22.5% of children live in poverty while only 9.3% of seniors do. Complexity of regulation- Regulators to banks has gone up since 1935. If you wanted to get table salt approved as a pharmaceutical you could not as it is dangerous in large doses. U.S. has the top 10 places in the world that is the most difficult to do business. Rule of lawyers rather than the rule of law- Tax code has over 9 million words. Tort cost as a % of GDP highest in U.S.
Decline in civil society- A decline in American institutions, declines in society to band together with charitable organizations in all categories from 95-2006. The end of the first quarter of 2013 brought with it widely-varying news as we were reminded yet again that the European Debt Crisis is far from over. The banking system in Cyprus required a swift and painful bailout and it brought the reality of how dire the Eurozone situation is right back to the forefront. Then in another wave of not-so-fantastic news, Chinese growth came in at a lower than expected 7.7% YoY, when 8% or better was expected. Fortunately, equity markets remained well bid (until last week anyway) and the U.S. housing market continued to show signs of improvement. Societe Generale reports on housing stating that the U.S. has experienced, "The strongest multifamily building activity since Jan 2006". The number of new housing units started in the U.S. grew by 7.0% to 1.036 million in March, which is coincidently the highest reading since June 2008. They concluded simply stating that, "Housing is now a tailwind to growth" and that they "Should continue to boost GDP and employment". 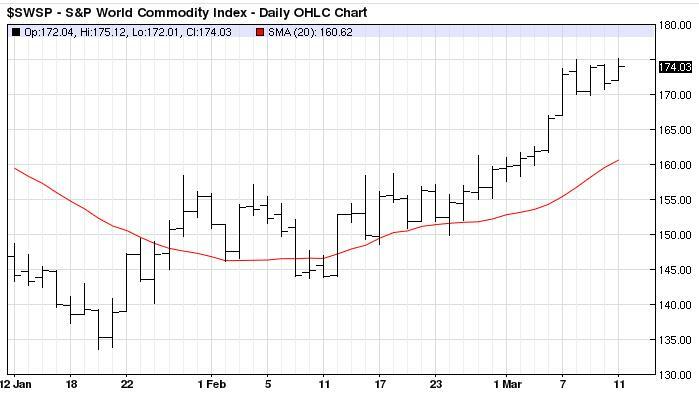 Last week, however, provided a slight reality-check as volatility shot up on a major selloff in Gold that resulted in the largest daily percentage loss (~12%) in that commodity in 30 years. It seems the majority of market participants are not worried about inflation anymore and because gold is a "store-of-value" to hedge against that, it sold off. My position in gold remains the same due to the fact that first, it is one of the most effective hedges against inflation and second, I don't know about you but I feel as though I am paying a lot more for things than I did just a couple of years ago. The point being that just because the official numbers say inflation is low, it does not mean that my dollar goes near as far as it did even just a couple of years ago. Maybe I am just eating healthier because as AFP reports that in March, "The index for fresh/dry vegetables swelled 21.5%." Overall, a lower commodity bill in emerging economies will undeniably help growth prospects. Time will reveal the real impact of the commodity cost savings, however, in India alone Barclay's reports, "The fall in commodity prices, if sustained, could reduce India's current account deficit by nearly 1% of GDP". On the jobs front here in the U.S. AFP reports that the number of recipients of unemployment insurance benefits during the week ending March 30th was 3.079 million, which was down 12,000 from the week before. Basically, the Fed suggests rates and their bond purchases will remain in place until unemployment reaches 6.5% or inflation surpasses a 2% annual growth. Both are estimated by most to be unlikely and foresee the end of Fed easing beginning in 2015 and potentially 2016. This leads to my last conclusion related to the equity markets which is summarized by James Paulsen best when he writes that the, "Overall, the upside in this stock market remains considerable should the Fed keep inflation under control in the next few years and allow this economic recovery to mature. By contrast, should the Fed's unconventional and massive monetary policies of the last several years spark an inflationary spiral, the stock market will not do very well, but it may largely end up not that far from where it is today. Consequently, the risk-reward character of the stock market over the next few years is probably more favorable than most appreciate." Barclays concludes that among the numerous concerns surrounding the global markets, "The recession and structural problems in Europe as being the biggest concern". They cite that it is far more of a concern than slowing Chinese growth or the "ongoing fiscal travails" of the U.S. They also state that, "While the European debt markets continue to show stability, and both Spain and Italy continue to access the market at reasonable prices, there remains no sign of a more fundamental correction in the major divisions between the north and south of Europe". The basic conclusion is that as we approach Q3 and the Eurozone remains on the slow-growth and ECB easing path, a 1.30 EUR will be much less likely than a 1.20 EUR. In spite of the broader risk in the region AFP reports last week that, "The Italian 10-year note yield dropped by 10bps to 4.22 percent; the Spanish 10-year note yield fell by 7bps to finish the week at 4.62 percent; and the winner of the week was Portugal, as its 10-year note yield dipped 25bps to 6.06 percent". The Eurozone troubles are far from solved, so stay tuned. The recent goal for Japan was simply to devalue the JPY to spur a bit of inflation to then kick-start the economy. What has occurred, however, is a JPY valuation that has raised eyebrows in the global trade community and shone a light on the competitive advantage that Japan would have by keeping a lower valued JPY. Soc Gen reports, that the U.S. Treasury warned Japan to "Refrain from competitive devaluation". This reveals that the 7% rise in USDJPY within a week proved too much for the Treasury to stomach. South Korea recently also indicated its unease with the rapid depreciation of the JPY. One thing to note is that, as a Barclay's report concludes, "There is no indication that the BOJ is going to pull back on its stated goals or actions and given the idea that they will be doubling the money supply, there remains ample room for the yen to decline significantly further than it has". Wells Fargo states that, "Short of throwing currency out the windows of the building, it is difficult to imagine how the BoJ might make policy more accommodative. In what seems to be a deliberate departure from ‘incrementalism,' the BoJ will stick to its bold new plan for now." Overall, the 2% inflation target will be extremely difficult to obtain and Barclay's suggests that "Despite the 19% yen depreciation since Q3 12" They estimate that at least, "Another 20% would be needed for the BoJ to meet a 2% inflation target within two years." JP Morgan concludes, "The BoJ indicated that its 2% inflation target should be achieved in around 2 years; this is very aggressive, since Japan has not generated headline inflation of 2% in over 20 years." GDP growth in China decelerated unexpectedly to 7.7% YoY in Q1 from the 7.9% YoY previously recorded. Additionally, despite accommodative policy, the March industrial production and fixed asset investment also came in decisively below street expectations. Standard Chartered reveals that, "The slower GDP growth rate was mainly attributable to weak consumption performance" and that "Retail sales growth in real terms slowed sharply in Q1 to 10.8% y/y from 13.5% in Q4-2012." Lastly, given solid consumer market fundamentals, most expect a solid recovery in China. Does "less uncertainty" in the global economic picture mean that the picture is then "more clear"? Unfortunately, those two are more different than a quick assessment would lead you to believe. I would venture to say that we will have less uncertainty in 2013 than we had in 2012 as it relates to asset values and overall global markets appreciation. I would not, however, state that anything surrounding the U.S.'s Fiscal situation or the European Debt Crisis or Chinese growth and inflation for that matter is any clearer when compared to 2012. Additionally, there will also be some interesting updates surrounding Japan as that country attempts to spark growth through a devaluing of the JPY, which has, according to Barclay's Bank, already declined on a trade-weighted basis by 15% since early November 2012. 1.1% for 2013 in what they call the Advanced Economies and 5.5% for the Emerging Markets. What is interesting in their report is that they suggest that the BRIC's (Brazil, Russia, India, China) will grow 6.6% for the year. For the U.S., Wells is concluding that we will likely see a pick-up in the pace of real GDP growth with an increase in real GDP of nearly 3% (annualized) in the first quarter of 2013. All of the hype around the impact to of the Sequestration on GDP is just that, hype. Wells Reports, "According to the CBO, outlays this federal fiscal year, ending in September 2013, will be reduced under current law by around $44 billion, not the widely cited $85 billion in budget authority. The majority of the negative effects on outlays, and thus GDP growth, will occur beginning in federal fiscal year 2014 and become more severe in the 2015 fiscal year and beyond." As a result, as long as growth tics up as expected, the impact will be minimal at best. Keeping a global mindset is key when making any asset decision and as evidenced above, the growth impact from emerging economies will continue to influence global growth in a positive way. And >as those economies grow, they develop their own consumer base and as consumers spend more, economies grow more. We can all take advantage of that if our portfolios are exposed properly to do so. Housing data in the U.S. is also improving at a steady pace as Wells reports, "Marking the eleventh straight monthly increase, home prices as measured by S&P/Case-Shiller and the FHFA increased 0.9 percent and 0.6 percent, respectively, in December. Both reports show price improvement broadening across the country as most regions increased during the month. Moreover, this marks the first annual increase in these home price measures since 2006. New home sales activity proved to be even more inspiring, surging 15.6 percent in January following December's 3.8 percent decline." It is important to note that as this component of the economy continually improves, so does consumer balance sheets, which affects overall confidence and increases spending. Home prices are one of the last "big" things to be repaired since the Great Recession and we are well on our way to a solid recovery in prices. The euro area economy contracted by (non-annualized) 0.6% QoQ in Q4 2012, the consensus was for a -0.4% QoQ. Unfortunately, the region remains in recession as Barclay's reports GDP dropped for a third consecutive quarter by -0.1% and -0.2%, respectively, in Q1 and Q2. GDP is also reported at -0.5% for the whole of 2012. A Wells Fargo report concludes, "The underlying trajectory of the Eurozone economy remains very soft and although confidence surveys have improved a bit in recent months, they remain at recessionary levels. Overall, a soft economy and accommodative monetary policy stance means we maintain a bearish outlook for the euro, targeting $1.26 within the next year." Societe Generale released a report that displayed a small bright side by stating that "Germany's ZEW survey showed a strong surge in expectations, rising to a 3-year high (economic sentiment) after the positive mood in both the equity and bond markets since the beginning of the year." Though they concluded in this report that, "Euro strength, however, may have been a headwind." As I have mentioned before, the European Debt Crisis has a long way to go before its long-term impacts on the EUR are completely understood. The EUR remains at above 1.30, though it is still not expected to remain that high by most market participants as we end 2013. In China, economic growth matched expectations at 7.5% for 2012 and most are maintaining a 2013 economic growth target of 7.5%, a CPI target 3.5% and a deficit target 2% of GDP. There was some speculation that the recent government call for a strict application of a 20% capital gains tax on home sales would impact growth negatively. It appears, however, that the probable lowering of volatility created from such an action may result in more stable growth over the next few years in China. The outcome for 2013 remains, of course, not any clearer than 2012.